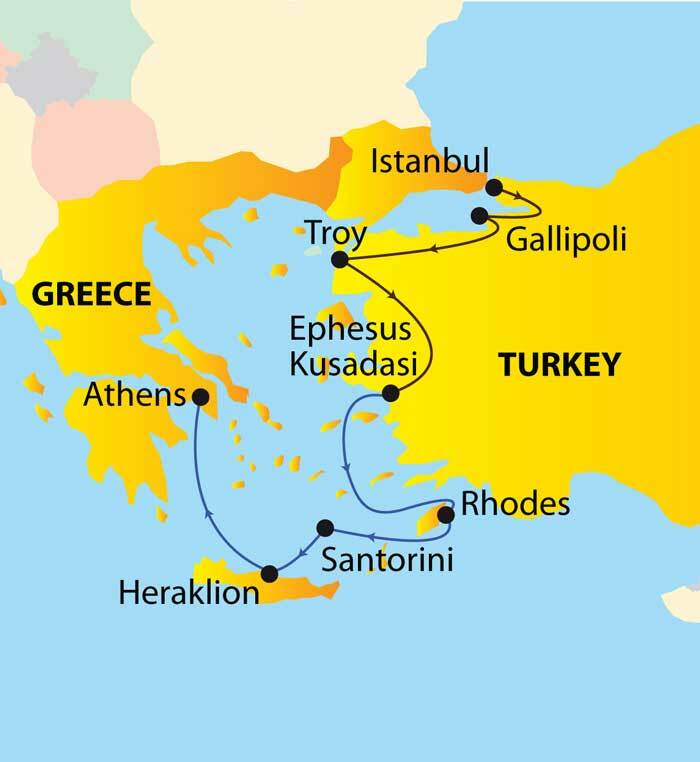 This 11-day tour offers the perfect combination of some of Turkey's most historic sites and a Greek Island cruise. After being amazed at the wonderful mosques, palaces and bazaars of fabulous Istanbul, find yourself reliving the fierce battles fought in WWI in Gallipoli. Once across the Dardenelle Straits, plunge into the early Greek era as you walk among the ruins at Troy with its legendary Trojan Horse and visit the first medical centre of Asclepion at Pergamum. 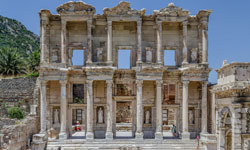 There is time to marvel at the perfection of the Greco/Roman ruins at Ephesus and visit the Mary House as well as relax by the sea, shop for Turkish carpets or take an optional excursion. From Kusadasi board your ship for a 3-day cruise through the Aegean with stops in Rhodes, Crete and Santorini before arriving in Athens for the grand finale. Arrival and transfer to hotel. Welcome briefing. Overnight at Radisson Blu Sisli Hotel or similar (2 nights). Today we visit Troy with its famous wooden horse. Before arriving into Asclepion, enjoy lunch with locals in a traditional local village. Then continue to Pergamum to visit the ancient Medical Center in Asclepion and continue to Izmir for overnight at Swissotel, Izmir or similar (2 nights). After breakfast transfer to pier and embark on a cruise ship at Kusadasi for 3 days in the Greek Islands. Cruise: Louis Cruise Line. explore the land of the fabled Atlantis.